November | 2007 | KBK Bakery's Adventures in Baking! It’s time to post the November Challenge from the Daring Bakers! Well… It was actually time 4 days ago. We’re a bit late. Had some family health issues that took precedence over postings! 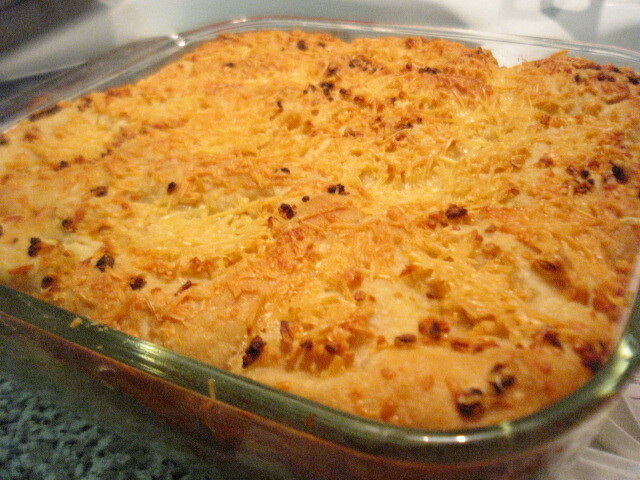 The challenge this month was to make a Tender Potato Bread. We experimented with different amounts of flour as the dough could have from 6 – 8 cups of flour. We did three batches with 7 cups, 7 1/2 cups, and 8 cups, respectively. 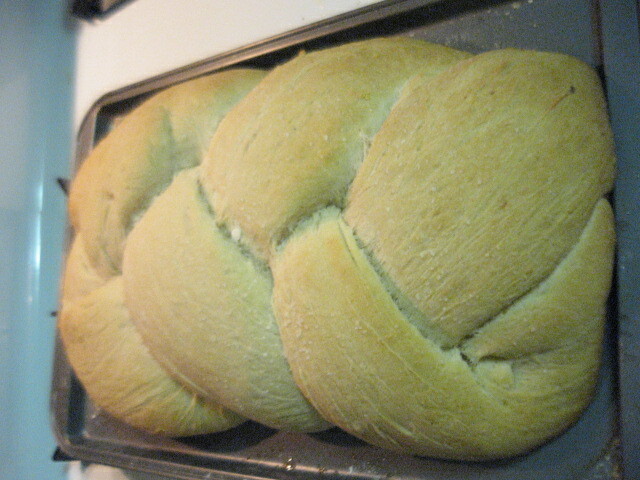 For us the 7 1/2 cup batch worked out the best for braiding a loaf. It even held up to braiding mini loaves for rolls. 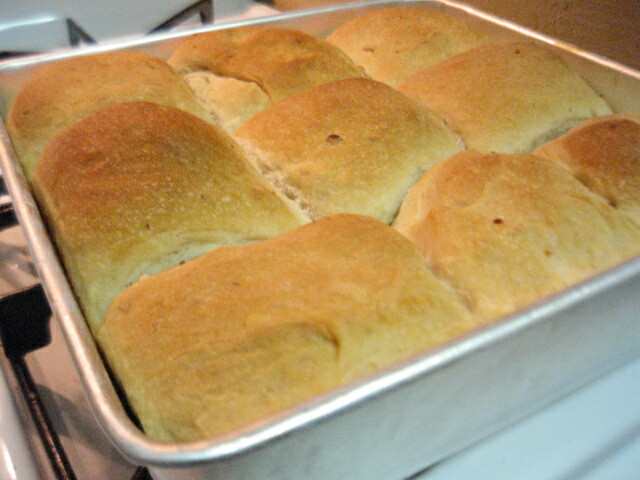 but was perfect to make a pan of little rolls. The 8 cup batch gave us more of a foccacia consistency. It wasn’t what we were originally going for, but it was a fine addition! The 7 and 7 1/2 cup batches were simply brushed with melted butter prior to baking. The 8 cup loaf was an attempt at a loaded potato bread. 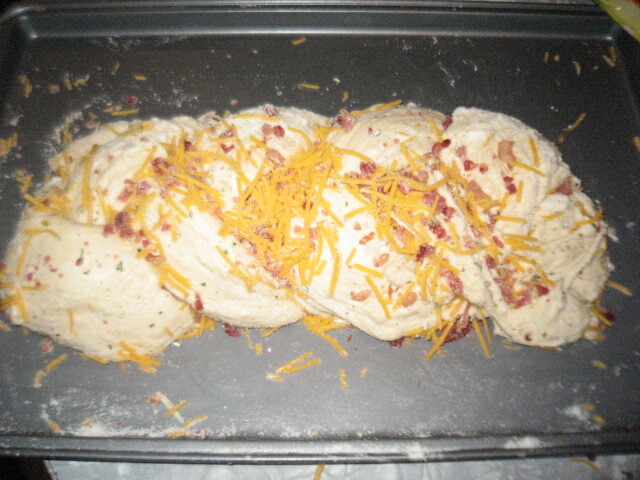 When shaping we sprinkled on Hidden Valley Ranch powdered mix, real bacon bits, and cheddar cheese. The taste was good on the inside of the bread where the toppings mixed together, but most of what was on the outside browned too much to have it’s own flavor. When we try this again, we’re planning to put the additions into the dough, rather on top to see how that works. For the remainder of the 8 cup batch, we made a pan of rolls and topped them with olive oil, minced garlic and grated parmesean cheese. These came out quite tasty, but baked a tiny bit too long. An additional note about the 8 cup batch. We were making all these batches at the same time with only one oven, so the second rise on this batch was very long. It originally rose well, but by the time it got into the oven it had lost some of its fluff. Well, with all that introduction we’ll shut up now! 4 medium to large floury (baking) potatoes, peeled and cut into chunks. Tanna Note: For the beginner bread baker I suggest no more than 8 ounces of potato; for the more advanced no more than 16 ounces. The variety of potatoes you might want to use would include Idaho, Russet & Yukon gold, there are others. Put the potatoes and 4 cups water in a sauce pan and bring to boil. Add 1 teaspoon salt and cook, half covered, until the potatoes are very tender. Drain the potatoes, SAVE THE POTATO WATER, and mash the potatoes well. Tanna Note: I have a food mill I will run my potatoes through to mash them. Measure out 3 cups(750ml) of the reserved potato water. Add extra water if needed to make 3 cups. Place the water and mashed potatoes in the bowl you plan to mix the bread dough in. Let cool to lukewarm (70-80°F/21 – 29°C) – stir well before testing the temperature – it should feel barely warm to your hand. You should be able to submerge you hand in the mix and not be uncomfortable. Add yeast to 2 cups all-purpose flour and whisk. Add yeast and flour to the cooled mashed potatoes & water and mix well. Allow to rest/sit 5 minutes. Note about Adding Yeast: If using Active Dry Yeast or Fresh yeast, mix & stir yeast into cooled water and mashed potatoes & water and let stand 5 minutes. Then add 2 cups of flour to the yeast mix and allow to rest several minutes. If using Instant Dry Yeast, add yeast to 2 cups all-purpose flour and whisk. Add yeast and flour to the cooled mashed potatoes & water and mix well. Allow to rest/sit 5 minutes. Sprinkle in the remaining 1 tablespoon salt and the softened butter; mix well. Add the 1 cup whole wheat flour, stir briefly. Add 2 cups of the unbleached all-purpose flour and stir until all the flour has been incorporated. Tanna Note: At this point you have used 4 cups of the possible 8 ½ cups suggested by the recipe. Turn the dough out onto a generously floured surface and knead for about 10 minutes, incorporating flour as needed to prevent sticking. The dough will be very sticky to begin with, but as it takes up more flour from the kneading surface, it will become easier to handle; use a dough scraper to keep your surface clean. The kneaded dough will still be very soft. Place the dough in a large clean bowl or your rising container of choice, cover with plastic wrap or lid, and let rise about 2 hours or until doubled in volume. Turn the dough out onto a well-floured surface and knead gently several minutes. It will be moist and a little sticky. Tanna Note: It is at this point you are requested to Unleash the Daring Baker within. The following is as the recipe is written. You are now free to follow as written or push it to a new level. Divide the dough into 2 unequal pieces in a proportion of one-third and two-thirds (one will be twice as large as the other). Place the smaller piece to one side and cover loosely. Butter a 9 x 5 x 2.5 inch loaf/bread pan. Flatten the larger piece of dough on the floured surface to an approximate 12 x 8 inch oval, then roll it up from a narrow end to form a loaf. Pinch the seam closed and gently place seam side down in the buttered pan. 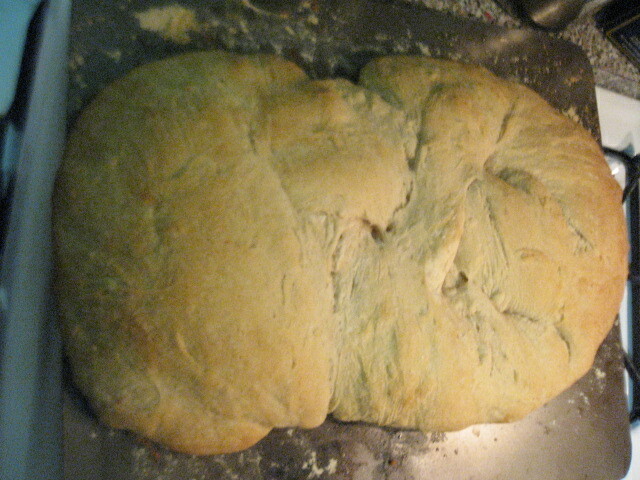 The dough should come about three-quarters of the way up the sides of the pan. Cover with plastic wrap and let rise for 35 to 45 minutes, until puffy and almost doubled in volume. Butter an 8x4X2 inch bread pan. Shape and proof the loaf the same way as the large loaf. Butter a 13 x 9 inch sheet cake pan or a shallow cake pan. Cut the dough into 12 equal pieces. Shape each into a ball under the palm of your floured hand and place on the baking sheet, leaving 1/2 inch between the balls. Cover with plastic wrap and let rise for about 35 minutes, until puffy and almost doubled. Flatten out the dough to a rectangle about 10 x 15 inches with your palms and fingertips. Tear off a piece of parchment paper or wax paper a little longer than the dough and dust it generously with flour. Transfer the focaccia to the paper. Brush the top of the dough generously with olive oil, sprinkle on a little coarse sea salt, as well as some rosemary leaves, if you wish and then finally dimple all over with your fingertips. Cover with plastic and let rise for 20 minutes. 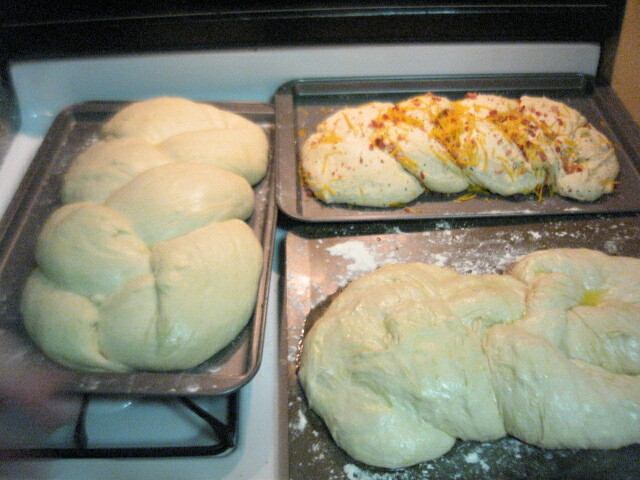 Note about baking order: bake the flat-bread before you bake the loaf; bake the rolls at the same time as the loaf. Note about Baking Temps: I believe that 450°F(230°C) is going to prove to be too hot for the either the large or small loaf of bread for the entire 40/50 minutes. I am going to put the loaves in at 450°(230°C) for 10 minutes and then turn the oven down to 375°F (190 °C) for the remaining time. Note about cooling times: Let all the breads cool on a rack for at least 30 minutes before slicing. Rolls can be served warm or at room temperature. 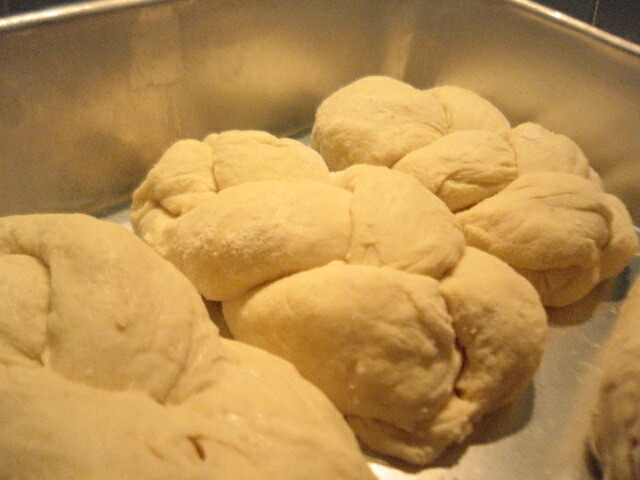 Bake rolls until golden, about 30 minutes. Bake the small loaf for about 40 minutes. Bake the large loaf for about 50 minutes. Place a baking stone or unglazed quarry tiles, if you have them, if not use a no edged baking/sheet (you want to be able to slide the shaped dough on the parchment paper onto the stone or baking sheet and an edge complicates things). Place the stone or cookie sheet on a rack in the center of the oven and preheat to 450°F/230°C. 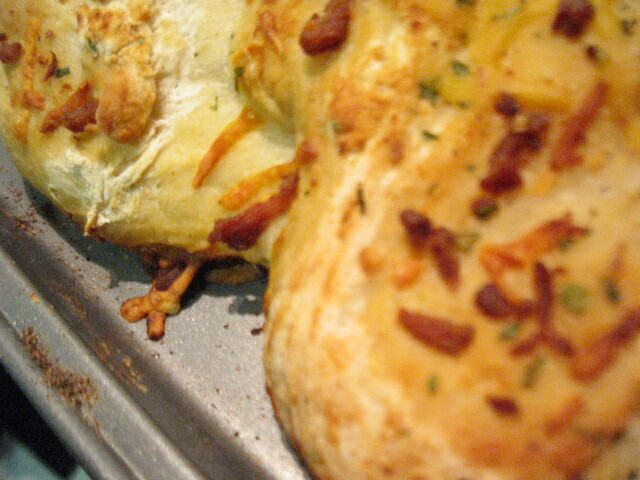 If making foccacia, just before baking, dimple the bread all over again with your fingertips. Leaving it on the paper, transfer to the hot baking stone, tiles or baking sheet. Bake until golden, about 10 minutes. Transfer to a rack (remove paper) and let cool at least 10 minutes before serving. Well, that’s it for this month’s challenge! I’m sure we’ll be seeing everyone a lot this month as it’s Christmas Cookie baking time! I’m a huge fan of the Christmas cookie and plan to bake my little heart out this month! You are currently browsing the KBK Bakery's Adventures in Baking! blog archives for November, 2007.